MUMBAI (Scrap Register): India major brass and copper scrap prices gained on Thursday, while copper futures prices at India's Multi Commodity Exchange settled higher as speculative flows and against the backdrop of falling inventories for the metal used in construction and power. 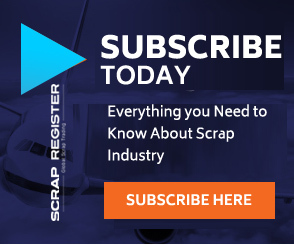 The major brass and copper scrap commodities on the Scrap Register Price Index traded higher on Thursday. The major brass and copper scrap commodities like Brass huny Scrap, Brass Accessories, Brass Shell 40mm, ACR Copper Coil 3/8, Copper armature, Copper Mixed Scrap, Copper Pat, Copper shell 40mm, Copper Super D.Rod, Copper Wire Scrap and Electrolytic Copper strip 25mm traded higher during Thursday. The most active November copper contract on the India's Multi Commodity Exchange settled higher by 0.72% to Rs. 372.70 per kilogram on Thursday from previous close of Rs. 370.05 per kilogram. Copper futures at MCX touched and intra-day high of Rs. 374.80 per kilogram and an intra-day low of Rs. 365.60 per kilogram during Thursday. Firm industrial output growth in top copper consumer China should support prices going forward. Investors who sent copper to a 17-month peak on hopes for a splurge of U.S. infrastructure spending by Donald Trump may end up underwhelmed given that the plans, even if successful, would add only modestly to world demand.